An ad for LifeLock services. This entry was posted on Monday, December 21st, 2015 at 4:30 pm	and is filed under A Little Sunshine. You can follow any comments to this entry through the RSS 2.0 feed. Both comments and pings are currently closed. So what were the Oracle settlement details? LifeLock has been advertised using spam recently. See http://blog.cloudmark.com/2015/12/18/lifelock-launches-new-spam-campaign/ . In Canada at this time you cannot get a security freeze on your credit file. You can only get alerts and ONLY after proving to them that you have been a victim of fraud. I’m supposing that’s because Canadians don’t get victimized the way Americans do. Anyone know anything about that or have an opinion on this morbid state of affairs? I’m normally not interested in government intervention in general, but as far as personal ID I’m rabid about heavy regulation of the consumer credit reporting agencies – they have been ducking regulations for decades with one promise after another, and I think it is high time to lower the boom on them! Afaict, the answer is that the Canadian banking industry and its regulators are incompetent. The founder of Life-Lock has a shady past already, so what did they expect? As far as Oracle goes – I can’t blame them, because I don’t know how many businesses complain when they can not get some application or another to work with the new Java, so keeping the older more vulnerable version is almost a prerequisite. Of course it is all Apache’s bag now! I lot of IT types simply include the old version in EMET and pray! Speaking of EMET – has anyone else had to replace it with Malwarebytes Anti-exploit yet? Brian, you are once again ignoring the true value of an identity protection service and focusing on nothing but credit monitoring. While you are correct that a freeze is more effective than monitoring, even a freeze can only prevent 15-20% of identity theft. For those issues that don’t involve checking your credit, a freeze does nothing. What you blatantly ignore when reviewing services like Lifelock is that they have experts who can help you with medical, criminal, and all the other types of id theft out there, the kind that a freeze does nothing for. So what do you want victims of those types of fraud to do, call you? Top end id theft protection will cover all types, not just financial. They will not only advise you how to clear it up, they will actually do the work for you. I recommend researching how these companies actually work before advising your readers to stay away, as you may actually be doing more harm than good. Pretty unfair criticism, IMHO. I’ve always outlined what these services are good for. What I have been trying to do is not discourage people from identity protection services, but to let them know the limitations of those services, and that people can’t expect to just be passive (sign up for a service) and stop ID theft. Krav: Please take your own advice and read and research what Brian has said about identity protection services. Both in this essay and in prior ones. You sound like a spin-doctor for one of these companies and it is really disgusting to see this stuff appear here. It insults the readers intelligence. HA ! If these “services” have to stand up in front of a Federal entity and hand back 100 million dollars and pretty much admit they are using deceptive measures to lure people in to their “services” – I’ll take my business elsewhere. Sure – this is just one of those services out there. NONE of which appeal to me. With a Freeze available, and proper planning prior to having a Freeze in place one can go for MANY years without having to make a major change. We all have our opinions about these services. Nothing here is written in stone as gospel, its opinions and perceptions of the data that is presented. There are many other services and blogs for that matter – that might better entertain your tastes. Just one follow up for you since you probably work for one of those companies. Can any of those companies call a credit card company on behalf of one of its clients? When the answer is an emphatic no, come back and tell us how either doing a freeze or keeping track of your own accounts, use of cards, and getting your free reports is any less effective than paying for any of those. Brian, sorry if my initial comment came off as attacking, I really am a big fan of the work you do. My issue is that I’ve never heard you mention the benefits of id theft recovery services, you just seemt focus on the credit monitoring aspect, which I agree is not of much value. I know they seem like a useless expense, but doesn’t all insurance? Since there is no way to prevent identity theft (again, a freeze only works on about 15%) doesn’t it make sense to have an expert available in case of worst case scenario? I have worked for a recovery service yes, but not LL (not a fan of their business practices myself). My point is simply that this type of coverage offers a lot more than credit monitoring, and when cleaning up id theft can take dozens of hours, it sure would be nice to have someone available to make those calls for you. The FTC deemed Oracle liable for not removing older versions of Java because of the security implications? Does that mean that they’re going to go after companies that don’t provide any sort of updates at all? Or shouldn’t they have sued Microsoft into the stone age for historically providing insecure software? Oracle refrained contemptibly for more than a year to remove out-of-date AND DANGEROUS versions of Java SE, motivating companies such as SingularLabs to create programs that removed those versions left behind after Java versions were updated. Java 7 update 26 was a prime example, causing an excessive number of my customers to spend lots to remove the malware injected afterwards by drive-by infections. Oracle should burn for that. Brian, I think you are being kind to LifeLock. Whether one has LifeLock or does not have LifeLock or any other solution, they cannot be passive about protecting their own identity. I am convinced that the particular individual will do a better job than any of the services offering. Therefore, LifeLock’s value is nil. Rush Limbaugh’s been shilling for LifeLock for years… I wonder if “El Rushbo” will disclose anything about this, or just continue to be a shamelessly complicit recipient of their advertising bucks? 😉 Mark Levin shills for them, too. Yes I remember the days when you’d install a newer version of Java and assume that the software would update or remove older versions of the Java software. Then when removing the old software, it would rip out some useful active code from the newest java installed, and it would force you to remove all and start all over. Not a big deal, the engineering team was informed and future updates were all stripped out and applied accordingly. I see a handful of larger corporations getting away from Java and going to HTML5. Its a better, quicker platform for most of the applications we use. I don’t understand the patch misery status of Oracle. They might like patching things on a constant basis. They hand out a boatload of patches for Oracle on quarterly basis. Java fits right in there as a software that requires constant tweeking in order to work correctly, for a short period of time. Can’t count the many times we’ve received a call from local police about an identity theft victim and they can’t resist adding that the person had id theft “protection” services at the time the info was used! Folks need to read the websites: every one has a disclaimer that no one can prevent identity theft. What does that tell you? The problem is that the state regulators can’t tell if the “restoration” services are in violation of any existing laws because every company claims that it has some “special” proprietary something they do and therefore can’t reveal what exactly it is. Java is still a huge problem for most corporate environments. Climate control, payroll systems, admin panels, PLC programmers are just a handful of things I have to deal with on a daily basis that all require some specific out of date version of java to run properly. Some of these systems costs tens of thousands of dollars and have no upgrade paths available. Just getting them to run properly in the first place is chore, add in the weekly java updates which seemingly break everything in their wake just makes me despise everything that Oracle has any involvement in. Error Java Virtual Machine must be Installed. I can beat that. Until recently, we had software that required Java6 on 64bit machines. Unfortunately, we haven’t been able to update that software. So the clients are still stuck on 6. We are slated to upgrade in the summer. I can top even that. We have a video switch that requires java 4 (yes, that is correct) to run in an large, highly customized operational training environment using real-time systems. When we updated the computers with the custom software installed with Java 7, the custom app broke. Alas, the requirements document say it requires “at least” java 6, which wasn’t installed. Installing java 6 didn’t work because the custom software installer doesn’t properly check to see what version of java 4 is installed. I literally had to trace the installation on a clean system (no java, no custom software) to find out the software was dropping java 4 in and running with it. When I explained what I’d found to the vendor, they basically said “sorry.” No support. Wouldn’t even convert the java 4 installation to an embedded java so I could load the current java version for all other uses. So the end result is we’ve blocked internet access for the systems with custom software and have to either block java upgrades or reinstall the custom software each time. Yeah, I love java. About as much as a root canal. I’ve complained about the Java updater for years.. What kind of moron thinks that someone in a smaller environment is going to log on as administrator individually on each machine 3 times a month to update Java? Other solutions exist, but they are generally going to be cost prohibitive for organizations with less than 1000 employees. IS LifeLock Ultimate Plus worth it? I pay for my spouse and I and Jr. protection $63.00 per month. In addition I gather my own annual credit reports, update my freezes on our credit, and reconcile my accounts almost daily. $63.00 a month may not sound like a lot of money–but in my situation it is! AM I WASTING it giving it to LifeLock??? In my opinion, it is a waste. If you are already keeping an eye and are aware of what is going on there is no reason to waste the extra money. Also, LifeLock does not protect you from anything, they are there to take your money and help you clean up after something happens. In my opinion, yes, your money could easily be used for other things. All of these ID protection services are cases of “closing the door after the horse has gotten out” scenarios. There are other things that you could be doing, all of them cheap or free. My bank’s ID protection is $3/month–although I just use that as a back-up. It’s still a case of notifying you days later about an attack. they will shut down–the good ones anyway–transactions that look suspicious. Freeze your credit with the credit agencies–free. Use a preloaded debit card for online purchases. Notify your card issuers when traveling abroad. Respond to NO ONE online asking for ANY identifying information. Use cash when you can. Use the pump closest to the window, or go inside to pay for gas. Your new doctor does not need your SS number, as much as they would like to tell you differently. Use two-step authentication for every site you use a card on. Still, they get through. Pay attention to card dumps, which Brian here always reports–do not trust the company to notify you. If you find that your store was included in the breach, replace your card. Lastly, check your online balance at least every week, and investigate unknown charges. Lifelock charges a lot of money for something that is easy to do–it’s just a question of getting into the habit of doing it. Thank you E. G. for your TIME and ADVICE! I just pulled up common types of ID Theft and how to prevent before the theft and how to rectify in case of ID Theft. But I will utilize all your suggestions as well. I could use my money more than LifeLock! It sounds like you are doing a lot on your own already. 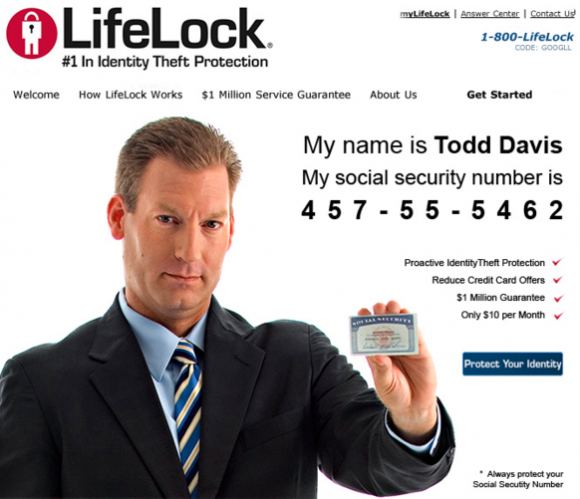 There are lots of cheaper alternatives to LifeLock. LifeLock’s services are the most expensive because it has to pay for its massive marketing and legal expenses. There are 100+ companies that offer ID protection and almost all of them are cheaper than LifeLock. LifeLock is primarily just a branded reseller of other companies’ services. Some services are free. If you have a MasterCard, you can get free ID theft alerts from CSID. LifeLock also uses CSID to generate alerts. Blue Cross Blue Shield has announced that it will begin to offer free ID theft protection to all members on 1/1/16. Does anyone know what the government does with these fines, such as the $100M to be paid by LifeLock? Have a suspicion that people harmed by LifeLock see very little, if any, of it. Lifelock begins all their advertisements with the statement “nobody can prevent all identity theft.” Then why people assume Lifelock can prevent all identity theft, I have no idea. It’s your fault if you sign up for something which you have no idea how it works. Another case of caveat emptor. #2: The choice to not remove it was one to accommodate the userbase which, much of it liked multiple versions installed for compatibility reasons. As much as I hate to defend Oracle after they attacked the RE security community, this is like suing Mark Zuckerberg a facebook account because it CAN lead to swatting – if people CHOOSE to take those risks, it’s NOT a matter of irresponsibility on the part of the company state but a personal choice and not one the nanny-state should be able to so-called “remedy” by taking their money. Entirely agree with Kyle. For us poor people dealing with archaic, critical systems requiring old JREs with no upgrade path, the behavior of the Oracle installer is a feature, not a bug. It just looks like the FTC went after an easy, juicy target to pad its achievement list. I’d be more impressed if they went after actual fraud, but that would require work. Please, of course an updater should replace previous versions. If that is a problem, not replacing previous version should be an option. I have no J2SE, Java 2, Java SE or Java Runtime Environment programs listed in my Control Panel Uninstall. But I have half a dozen Java folders with program files. Oracle’s uninstall tool (https://java.com/en/download/help/uninstall_java.xml) says that I do not have any Java installed. Am I to believe that after this settlement? I find it infinitely amusing that any company in this day and age is posting a removal tool that requires their software to be installed to use the removal tool. Sadly many uninstallers leave files & registry keys behind, it’s hardly an Oracle specific phenomenon. But that’s why removal tools exist, to clear up those remnants. Only Oracle is schizophrenic enough to require you to install their software in order to use their tool. I LOVE to hear that LifeLock is being held accountable. with very little research, you will see that the founder of Lifelock is a criminal; https://en.wikipedia.org/wiki/LifeLock; I know that Wikipedia is not a perfect source, but there are plenty more sources available. They hyperbole in the comments make be laugh. LOVE, criminal, shilling, harmed, etc. Lifelock started out issuing and renewing credit freezes for their customers. This was a pretty effective way to mitigate issues. As a customer, I personally experienced this when the bank I was using for a mortgage refinance needed my assistance in obtaining my credit report after I gave them permission to pull one. The process Lifelock was using was cutting into the credit bureau’s ability to monetize the credit data they managed. Experian successfully sued Lifelock on the grounds that the law did not allow Lifelock to issue credit freezes on behalf of their customers. Subsequently Lifelock was reduced to passive credit monitoring, the same service they provide by all monitoring services. The FTC exists to shakedown businesses pure and simple. They are not the Justice Dept. and hve no law enforcement capabilities whatsoever. You either come to a payment agreement with them or they sue you in civil court. If you choose to go the latter route, your business will get investigated/shaken down by other Federal agencies like the IRS. $100 million is a huge fine, but still costs less than fighting an entity which uses finances itself with your money and can drag its investigation on indefinitely. An FTC shakedown is not like a class action lawsuit, where compensation is awarded to those who can demonstrate injury. The money “will be provided to the FTC for use in further consumer redres”. As further proof that the FTC is nothing more than a payola enforcement unit, it should be noted that LL must pay a hefty fine, but is NOT required to change any of their practices. This fact was included in earlier stories, but is now absent. So what does that say about the profit margins of LL that they can afford to pay $100M in shakedown fees to continue business as usual? The NYT just made a big thing about 191 million names from voter records. Most people do not know that this information is public record, and in the past, used to contain social security numbers ! These data basese were on “micro fiche” 50 years ago for most counties in the USA, and were used for many lawful purposes. Not a schilling but a customer of capital one quicksilver. I received 2 emails that surprised and delighted me, my cable bill jumped 20$ and so I logged in (auto-pay here) and they let me know. Second was a generous tip I gave to a bartender (he comped me) about 30%. First time I saw that. And I got my cable bill back in line to boot.!! !